Activity – Home of Gliph messaging and connection requests. Check out the new whirlwind icon. Connections – List of your Gliph connections. If you look carefully at the icon, you’ll see it is a ring of diamonds. Cloaked Email – Dashboard for managing Cloaked Email. Create, manage and get more in this view. Find Gliphs – Search for other Gliph users and send them connection requests. Invite Friends – Stay in touch with your pals and get free Cloaked Email addresses when they sign up. neato. Settings – Edit and set sharing on your Facet information. Set security options and more. iOS and mobile both have their own extra settings. The conversation view for Gliph messaging now tells you when a message has finished sending. For picture messages, you now will see a status bar to watch upload progress. We’ve also greatly enhanced the clarity of picture message thumbnails in the conversation view, (ya that bugged us too). We will continue to improve this experience and welcome your continued feedback: support@gli.ph. 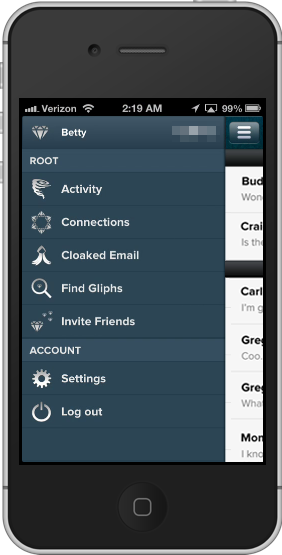 For now, we suggest Android users try the mobile web app to see Gliph picture messaging and the new menu. Hang tight, we’ll be updating the native Android app when we can. That’s largely the update. 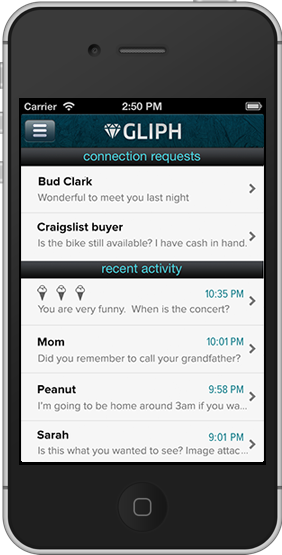 We hope you like the updated design and navigation of the Gliph app. Please email us and tell us what you think: support@gli.ph.